‘Pozzo Divino’ is a witty play on words: literally meaning ‘divine well’, it also translates as ‘wine well’ when read as ‘Pozzo di Vino’. The ancient well is now the cellar that hosts Pozzo Divino’s wine tours. Dating back to 1312, the well was built to supply water through a vast system of underground tunnels and pipes to the prisoners of a local prison known as ‘The Stinche’ (now Teatro Verdi) that stretched as far as the Bargello. Pino bought the location in 2006 and restored it himself with the help of some friends. 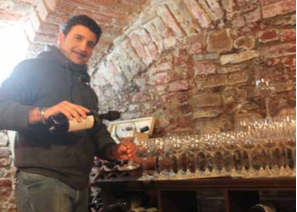 Despite its restoration, Pino reveals that it was always his principal intention to maintain a tangible sense of history when stepping into the cellar. This is something he has undoubtedly achieved; the place is almost like a time-machine propelling you back a few centuries into a part of authentic medieval Florence – albeit in excellent condition. Pino imparts his knowledge while taking guests around the cellar, offering a range of Italian wines to sample with an appetizer of complementary regional cheeses, cuts of meats, bread, olive oil and balsamic vinegar. Pino boasts that 90 percent of the wines he holds are of Tuscan origin, and that his tours prove so popular that he often ships back boxes of the wine sampled to America in order to appease impressed customers. Those looking to take a taste of Tuscany back home can find comprehensive information on shipping zones and freight costs on the company’s website. Pozzo Divino’s wine tours can be organized for tourist groups, families and universities, and cost only €15 a head – which not only makes it an experience to enjoy over the festive season but also an ideal Christmas gift for lovers of Tuscany’s finest vintages.